Sagarmatha National Park covers the highest peak in the world, Mount Everest at 8,848 m, and its surrounding high mountain ranges. It is an area of geologically young mountains with sharp peaks and glaciers. The Dudh Kosi river originates here. Gokyo Valley (a RAMSAR site) has a number of lakes. The park is located in north-eastern Nepal, in the Solo-Khumbu region. It encompasses an area of 1,148 km2 and ranges in elevation from its lowest point of 2,845 m at Jorsalle to 8,848 m at the summit of Everest. Most part of the land is barren, with grazing lands on the lower elevations. There are relatively few mammal species due to evolutionairy factors. There are no roads to this WHS, so for a visit you have to walk in from the nearest airport - it's 2 days from Lukla. Although there supposedly are helicopter flights nowadays that take you straight to Everest Base Camp and skip all the hiking! I went on foot, and did an 8-day trek known as the Everest View Lodge Trek. I had never hiked for such a long period on end before, but in retrospect felt it was pretty easy. Day walks were never longer than 5-6 hours including lunch and plenty of rests. This trek is the same as the first part to the Everest Base Camp. I think I could have made it there too, but must say that I already was pretty bored after 5 days. It was early in the season, not many other travellers around and several shops/restaurants/lodges were closed. And cold it was during the night: I needed a sleeping bag plus 2 blankets! Every night we went to bed at 7.30 pm because of the cold, and because there's nothing to do in the villages. The forte of the park and the trek clearly are the mountain panoramas. The sky was clear blue on most of the days, and I saw Everest no less than 4 times (once already from the flight in from Kathmandu). The first half of the hike from Namche Bazaar to Tengboche had the best views on Ama Dablam, Lhotse and other 7000-ers. The local flora (not in bloom) and fauna (scarce except for black crowes) I found not too exciting. Despite its remoteness, about 30,000 people a year visit the park. Leaving often is the hardest thing on a trek from Lukla, and so it was for me. On the day I was to fly back to Kathmandu, one big cloud covered the valley (although the sky was blue and the sun was shining). The day before there also had been no flights, and it was anyone's guess how it would be tomorrow. So I accepted an offer to take a helicopter back down to Kathmandu for 150 US dollar - a sum I would have paid alone just for the experience to once sit in a helicopter! I had so much fun! The scenery was amazing and looking up at the Himalayas made me feel very small. I love taking pictures and if you are a budding photographer this is the greatest place to start. I strongly recommend it to anyone who is looking for an adventure or just to relax. it was the holiday of a lifetime and the national park made it better! 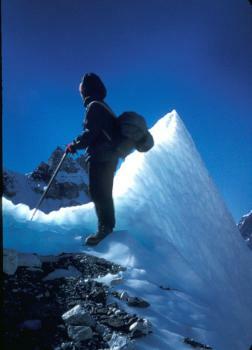 Few are those who have the will, fitness and stamina of climbing to the summit of Mt. Everest. Most will be happy to reach the Everest base camp but it has become quite touristy a trek and unless you're a mountaineering fan, 2-3 weeks might seem too much to spend to simply reach the base of Mt Everest. Since my main focus in Nepal was not mountaineering and I did not want to spend 2-3 weeks trekking, I opted for the Mt. Everest flight on a clear early morning to see the first rays hit the peaks of the Himalayas and Mt Everest or Sagarmatha. The trip was 1 hour long and since the flight was not full I had several opportunities to visit the cockpit for a panoramic view. All passengers have a window seat and the air hostess indicates the different names of the peaks you pass by. I travelled with Buddha Air who are known to be the best in terms of safety. Only worth it on a clear day with no cloud cover. It is surely the best flight I've ever made and you get much closer to the Everest than when you are landing in Kathmandu on your international flight. If you're a mountain fan by all means go for the Everest base camp, otherwise this is quite an interesting experience and it will get you much closer to Mt Everest. Very few of us are going to reach the summit of Sagarmatha/ Qomolangma/ Mt Everest (though news of 40 climbers passing a dying man during 1 morning in May 2006 seems to indicate that it is a bit like “Piccadilly Circus” up there in season nowadays!) but the “walk in” through the WHS park to the Base Camp is available to any reasonably healthy person – it qualifies as “strenuous” but is achievable with some appropriate fitness preparation. It is not the most beautiful of Himalayan treks and some regard it as a bit of a grind but the objective and the historical connotations make it, in my view, a particularly worthwhile journey. I did it some 35 years ago and have always regarded it as time, effort and money very well spent! The purist might want to do the full “walk-in” but those with shorter holidays will short-cut this by flying to Lukla to avoid the 8 day trek from the road-head at Jiri. You will still need around 12 days to/from Kathmandu depending on how many detours you take and how much acclimatisation time you want in order to avoid what might be your main potential problem – altitude sickness. This flight unfortunately also adds additional uncertainty both in the form of potential weather problems (either at Lukla or at Kathmandu) as well as in getting a seat on a flight in AND, equally importantly, out! In this latter case it helps to have an agent with “pull” when the chips are down after a few non-flying days because of the weather and the queues to get out are growing (Ice axes were brandished by competing passengers on our return flight)! The spiral “drop down” to this tiny airstrip on a steep slope deep in the Khumbu Valley is very spectacular with a fine view of Everest and its snow plume to give you appetite for the trek ahead! On landing your plane will be surrounded by Sherpas jostling for their (extremely heavy) share of the luggage! Over the next c2 weeks you will grow to respect their cheerfulness, friendliness and strength as they carry, cook, make camp and guide. Meeting them and seeing their life in the villages is one of the pleasures of the trip. 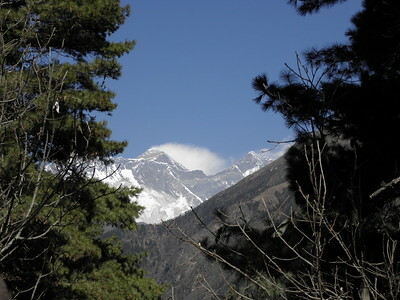 Although you will have entered the Sagamartha National Park some time earlier, it is only after the steep climb out of the “Sherpa town” of Namche Bazar on the second or third day of the trek that you will see Everest and reach the aptly named “Everest View Hotel”. It flies in its customers and once claimed to be the highest in the world at around 12,700ft (3880 mtr). Perhaps it was true then, but there are certainly others located somewhat higher now (eg in Tibet at New Tinggri and Rombuk). Next, the glorious peak of Ama Dablam dominates the route for several days and, at the monastery of Pangboche, the full magnificence of Everest and the Lhotse/Nuptse Wall comes into view. When we were there the monastery was holding a religious festival to add to the interest. The number of days from here will depend on your trek’s acclimatisation policy – we spent a day here and another at Dingboche, with walks at each so as always to experience higher altitude than the night’s camp. The normal final camp is at Gorek Shep – just a yak herder’s hut in 1976 but, I believe, now the site of several tea houses/lodges. Again, depending on the trek, you might stop here 1 or 2 nights. The problem with the (more normal) single night option is that, although it reduces the period you stay at around 17000 ft and hence might avoid altitude sickness problems, in theory it forces you to choose how you spend the next morning before descending to Lobuche. You can either walk to the top of the nearby “peak” of Kala Pattar at 18500ft with its magnificent views of Everest and surrounding peaks or continue up the glacier to Base Camp. This is slightly lower and has less spectacular views but possesses more “historical” resonance. I remember I overcame this dilemma by pushing hard on the day from Lobuche up to Gorak Shep in order to arrive early enough to continue up Kala Pattar, thus leaving the next day free to go on to Base Camp before rejoining my companions back at Gorak Shep after their climb of Kala Pattar. I wonder to what extent “global warming” has reduced the amount of ice on this lower part of the Kumbu Glacier. In 1976 there were still some reasonably spectacular sections (photo). The Base camp area was a bit of a mess from trekking/climbing detritus but I understand that considerable clearing up work has been done since then. On your descent you will feel like a winged Mercury as your “altitude training” kicks in! Now you will really be able to enjoy the scenery. Unfortunately the “Yeti Skull” at Pangboche monastery which I saw on the way down, having been unwilling to summon up the extra effort for the climb to the monastery on the way up, has since been stolen. Another example of the need in this life to grasp every (travel) opportunity while it is available! Fatal Accidents or 'disasters': There have been over 296 recorded deaths of climbers on "Everest". The worst single event was the result of the 25 April 2015 earthquake when at least 17 climbers died when an avalanche hit Everest South Base Camp. Foreigner prices: Variations between Nepalese, SAARC nationals and other Foreign Nationals. Ranging from free to 3,390 Nepali rupees. On Banknotes: Mt Everest was on the Chinese Renminbi Fourth Edition ¥10 note from 1988-1999 which is thus also in the Sagarmatha National Park. Name changes: The "quiet" dropping of the "colonial" part of the name - "Sagamatha" was called "Sagamatha - Mt Everest" in the nomination documents. It isn't clear exactly when/why this difference occurred but the shorter title was already used in the 1979 WHC minutes recording the inscription.